Family vacations elevate travel planning to a new level. Not only do you, the parents, have ideas of what your perfect vacation will be like, the children also have their own ideas of fun. While your ideal vacation may be a leisurely breakfast and reading a good book on the beach, you know your little ones have something else in mind and they will need to be active. That does’t mean that you won’t have fun, but all family members need to be considered when planning your next family trip. Over the next few posts we will breakdown our favorite European travel locations for children of all ages. Knowing that different ages bring different needs, these locations will be grouped by those that are under school age, the big kids, and tweens and teens. All locations also take into consideration the safety of the area, ease of getting to the destination, access to health services, and general family-friendliness. However, it should be said that pretty much anywhere in Europe is great for the whole family so feel free to pick and choose based on what your family likes best. And don’t feel bad if you want to pick a city on your bucket list. Your kids are almost guaranteed to love it and find fun things to do. 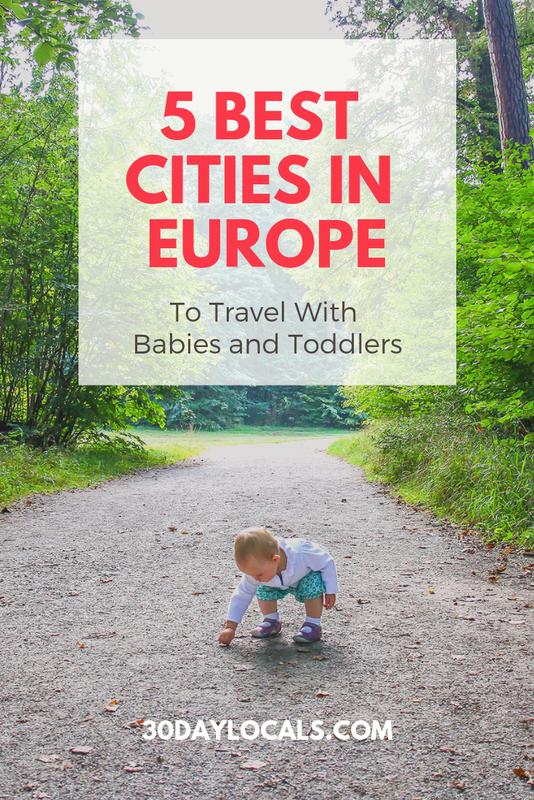 These are the places we recommend visiting in Europe with a baby, toddler, or pre-schooler based on our experiences and research. 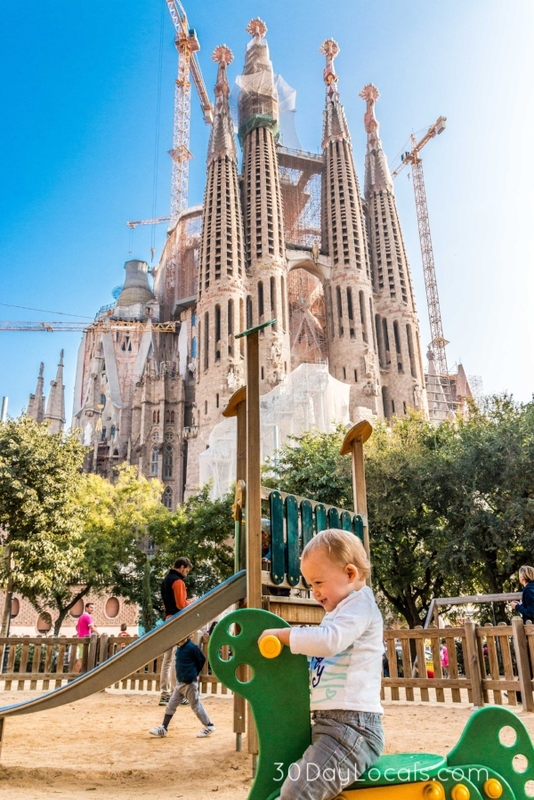 Our first visit to Barcelona was when our daughter was 18 months old. We toured the popular sites like Gauid’s Guell park and the Sagrada Familia. The beautiful colors and dramatic architecture are interesting to both young and old alike. All of us enjoyed the rainbows inside the Sagrada Familia cathedral and better yet, the playground just across the street. Barcelona offers great food, easy access via transportation throughout the city, and great weather. It’s close proximity to fun cities like Girona (only an hour by train) with an amazing old town and cobblestone streets, and beaches make it a wonder vacation spot. Girona was also a big filming location for all of you Game of Thrones fans out there. Start your Barcelona Family Vacation Research here with a look at hotel recommendations and flight search. We love visiting Munich. The city has so much to offer to families - large park spaces, great playgrounds, good museums, and a laid back attitude toward life. We’ve even written about how Octoberfest is family friendly and what it was like when we took our 15 month old daughter there. For the little ones, Munich offers good museums, plenty of people watching opportunities - like surfing on the Isar River (our daughter loved watching this! 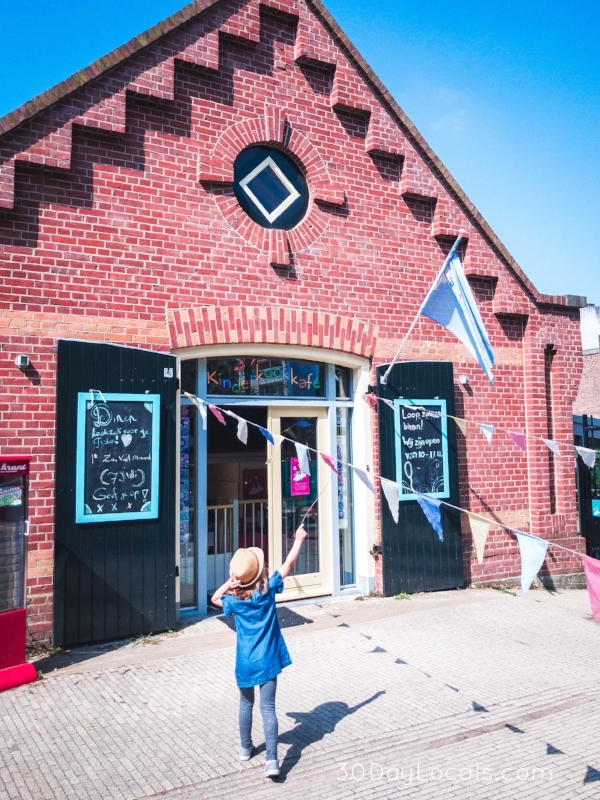 ), and amazing kinderkafes where parents can enjoy sipping a coffee while the children play. Start your Munich Family Vacation Research here with a look at hotel recommendations and flight search. We visited Amsterdam with our five year old earlier this year and we all had a great time. Younger children will love the canals where you can watch the boats pass by or take a leisurely cruise of your own. The zoo is fantastic and actually had some of the best food we’ve ever eaten at a zoo/family attraction. You can spend time sitting at a cafe and watching the people wiz by on bikes and you can be almost certain there will be a park or playground near by for your little one to burn off some energy. For more ideas, be sure to check out our post about the top things to do in Amsterdam with kids. We’ve included Amsterdam in our recommendation for the younger crowd because while it’s actually really easy to slip past the seedier part of the city, the littlest ones will have no idea about the city’s reputation. Start your Amsterdam Family Vacation Research here with a look at hotel recommendations and flight search. Okay, so I know that Scotland is a country and the other places listed here are cities, but hear me out. If you have to pick one city, you can easily go with Edinburgh, which we really enjoyed. But, we loved our 10-day Scottish road trip even more! If your child doesn’t mind riding in the car, this will be easy for you. You’ll be able to drive about 5-6 hours a day and be able to make it all the way up through the Isle of Skye. Our daughter did not like being in the car much so we took advantage of nap time and logged about 4 hours of drive time a day. We made it to the Isle of Skye, but not quite as far north as we originally planned. Along the way you will be able to stop at castles, wander along meandering brooks, probably see some sheep, and can even stop for a distillery tour (Dewar’s will allow children under 12 on the tour). The landscape in Scotland is just beautiful and the weather was nice in August when we visited, but still chilly so be prepared and know this is not a beach vacation. 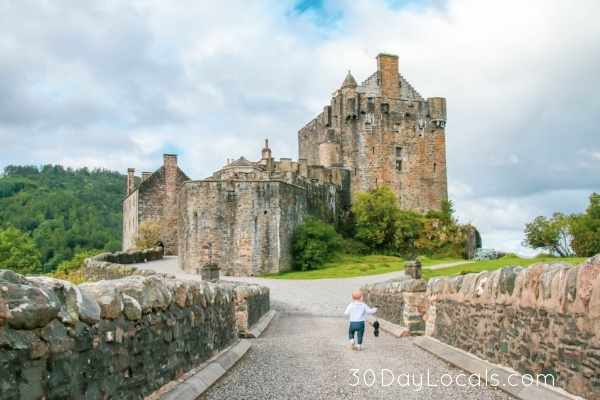 Start your Scotland Family Vacation Research here with a look at hotel recommendations and flight search. Such a beautiful city with so much to do, Seville had to be included on our list of places to visit with young children. There are playgrounds, great food (tapas are a wonderful way to get your child to try new foods), and festivals like Feria to partake in. After spending a month in Seville at the beginning of summer, we highly recommend the city. You can read more about our recommendations for things to do off the beaten path or our suggested itinerary for visiting Seville with kids. Highlights include Maria Luisa Park, horse carriage rides, local playgrounds, and a kid-friendly food tour. Start your Seville Family Vacation Research here with a look at hotel recommendations and flight search. In the end, babies can travel with you anywhere. 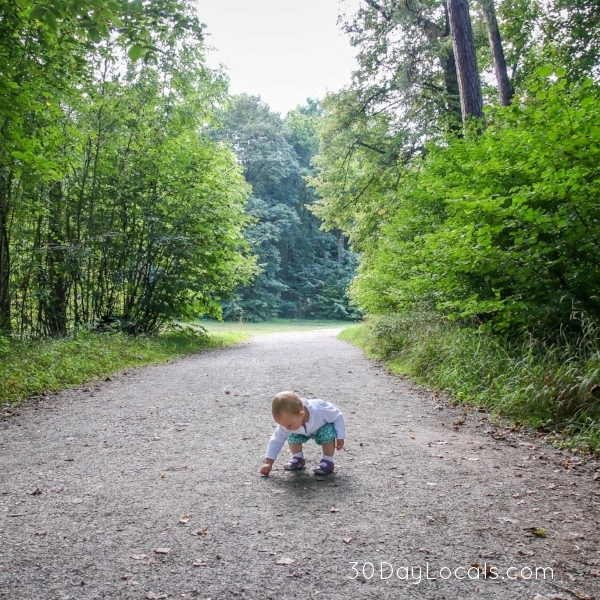 Toddlers can be tricky because they are mobile, but with so many parks and playgrounds, Europe is a safe bet. And your preschoolers will love it. The sights, sounds, smells, activities…our daughter loves being in the hustle and bustle. Europe is great for family vacations and it’s easy to see why it is so popular. If you’re worried about the flight, don’t stress too much about it. We have even written about our tips for over coming jet lag with kiddos and how the anticipation of the flight is much worse than the actual thing. It goes quick and before you know it, you are exploring the cobblestone streets, sipping cappuccinos, and listening to your child’s squeals of delight in the park.